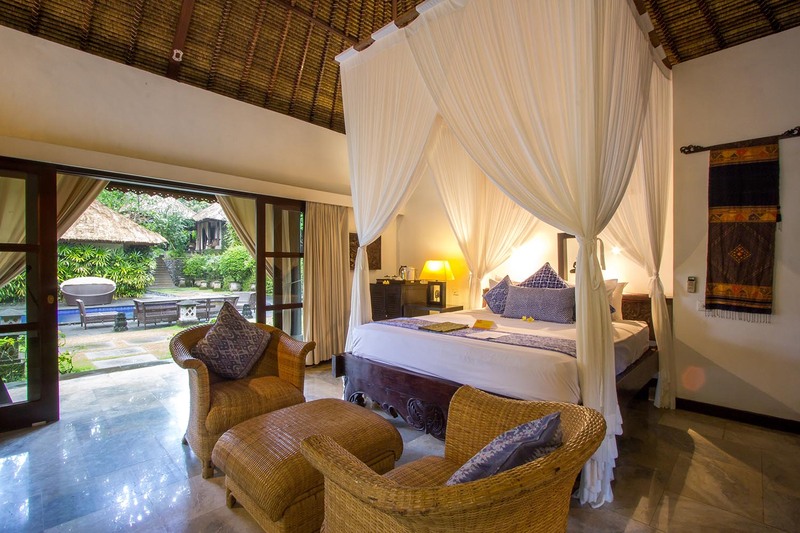 With just eight stunning villas nestled amid rice paddies, jungle and a river in the peaceful Balinese village of Bebengan, Sukhavati Ayurvedic Retreat & Spa is an intimate and elegant health and wellness destination where the focus is solely on you. The resort specialises in Ayurvedic healing therapies to purify and rejuvenate the body and mind, and the caring staff here will go out of their way to customise your retreat down to every last detail that you want to focus on. From weight loss to stress release, detoxing and alleviating chronic ailments, they can design a programme to help you create a healthier and happier life. 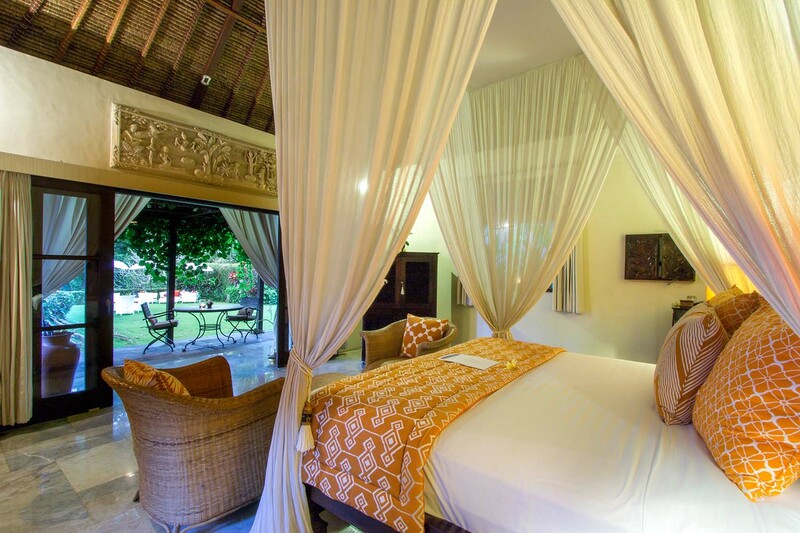 Your experience at Sukhavati Ayurvedic Retreat & Spa starts when you check into your five-star villa where you can relax amid modern comforts and soak up views of the lush surroundings from your own private balcony. 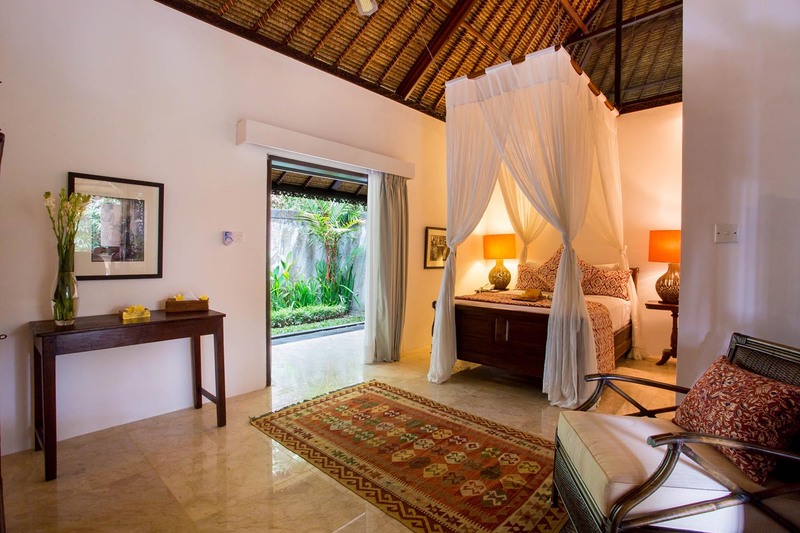 After you’ve had a chance to settle in, you will meet with the resident Ayurvedic doctor, who will determine your specific needs to outline a personal rejuvenation programme tailored to your goals. Then for the duration of your stay you can expect to be pampered with divine spa treatments, energising yoga sessions, healing body therapies, and fresh Ayurvedic meals. At the start of your Rejuvenation programme at Sukhavati, you will receive a detailed consultation with our Ayurvedic Doctor who will confirm the influences of the doshas (Vata, Pitta, Kapha) on your physical, mental and emotional health to help determine the Ayurvedic treatments that will be scheduled for you. The team will create a personally designed treatment programme (Panchakarma programme) to rejuvenate the whole system, detoxify the body and relax the mind. Recommendations are unique to each individual and are validated by observation and deep knowledge derived from the ancient Vedic texts to ensure a long and healthy life. Your programme will incorporate comprehensive spa treatments, yoga, specialised healing diets, meditation, daily health consultations and lifestyle seminars. 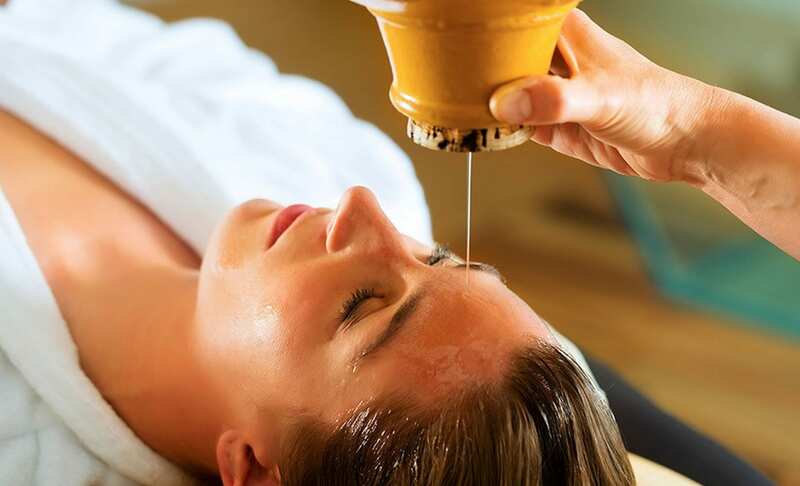 Take some time out from your busy schedule to reset, recharge and relax with our 4 day programme, and get a taste for the ancient healing system of Ayurveda. Experience 90 minutes of Ayurvedic treatments daily, enjoy wholesome and nutritious Ayurvedic cuisine, practice twice daily yoga, and unwind in our beautiful estate. At the end of your time at Sukhavati you will leave with sparkling eyes, glowing skin and renewed energy and vitality. ++ Prices are subject to 15% tax and service charge. Escape, slow down and recover your energy; our 7 Day Refresh programme will support your body’s natural healing ability. Embrace a new sense of wellbeing, leave feeling refreshed with a new level of energy and happiness which will continue long after the programme finishes and set you on your path to perfect health. This programme is best suited to those who want to experience the benefits of our programmes but don’t have the opportunity to stay longer than 7 days. If you lack energy, are feeling stressed or noticing the early signs of imbalance like stiffness, pain, poor sleep or poor digestion; then start planning to take time to focus on you. Dr Bruce Lipton at Harvard University estimated that 90% of all illnesses are stress related. Realising that you need to take time to slow down and unwind is important. The Revive Programme allows for a more intensive rejuvenation treatment over a longer period of time. Allowing more time to take these healing treatments enhances the benefits of the program providing a more profound effect of transformation. 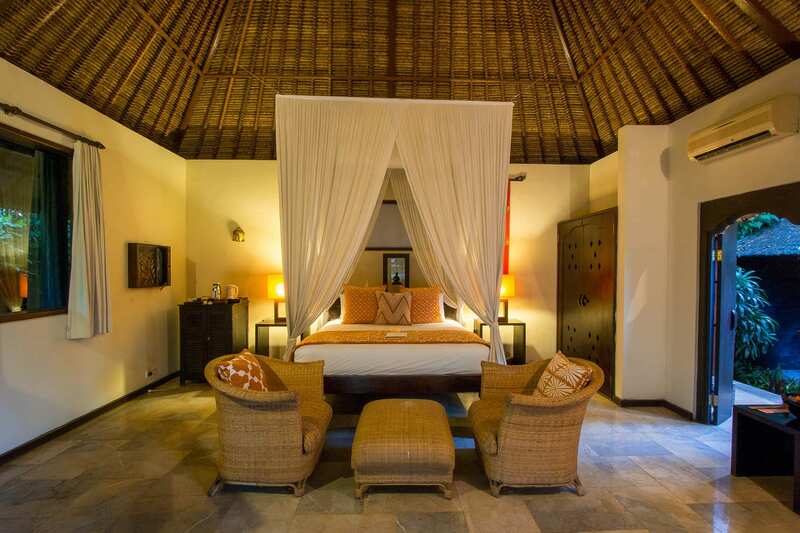 The eight villas at Sukhavati are spread out amongst the rolling hills of the estate, and each features marble floors, thatched roofs, modern furnishings and beautiful bathrooms, many of which are open to the skies. The one-bedroom luxury villas are bright and breezy and have private balconies that look out over the peacefulness of the estate. For added luxury, book into one of the private pool villas to enjoy a secluded garden, private infinity pool and lush outdoor living spaces. 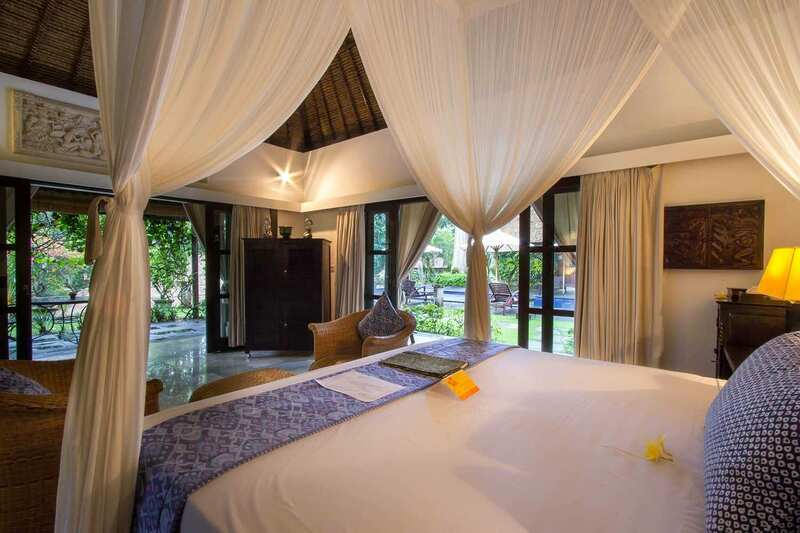 Larger groups can also take advantage of the two spacious bedrooms and bathrooms in the self-contained two bedroom private pool villa. 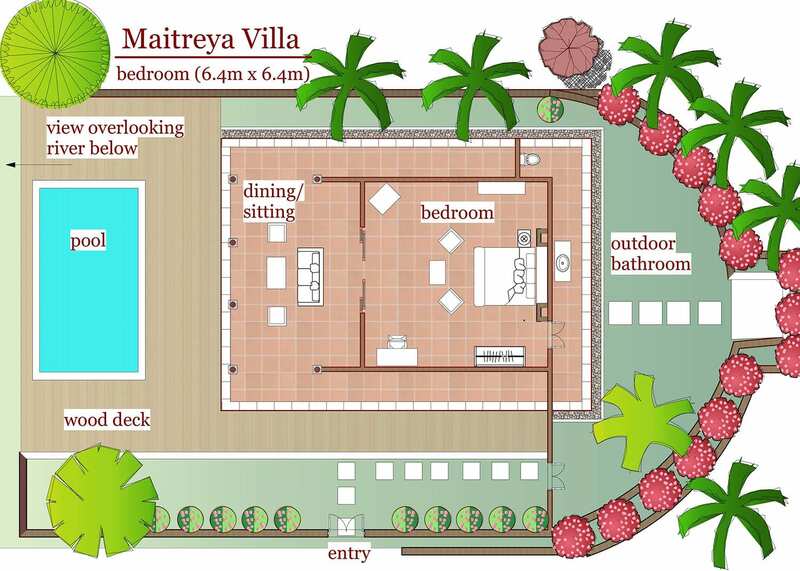 A large luxury villa situated at the bottom of the main stairs as you enter the Lower part of the estate. On the right side of the estate tucked into the cliff side is Villa Samanathabha. 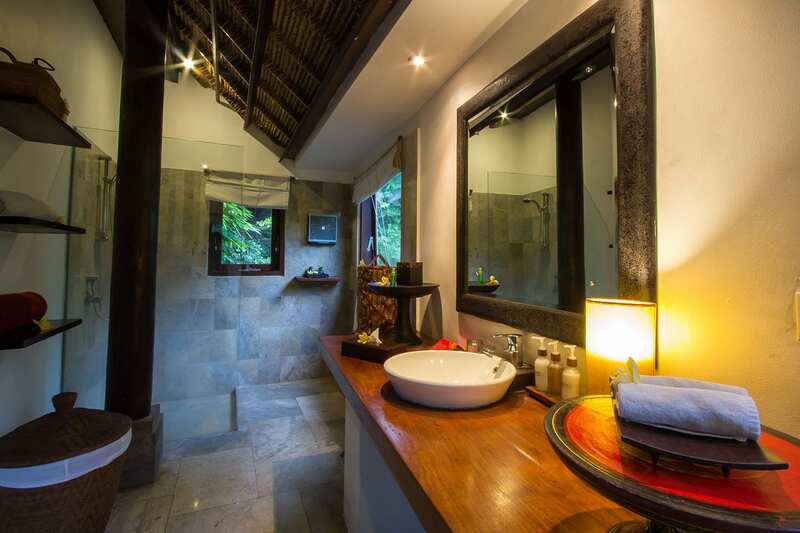 This villa boasts an outdoor bathroom complete with all amenities. 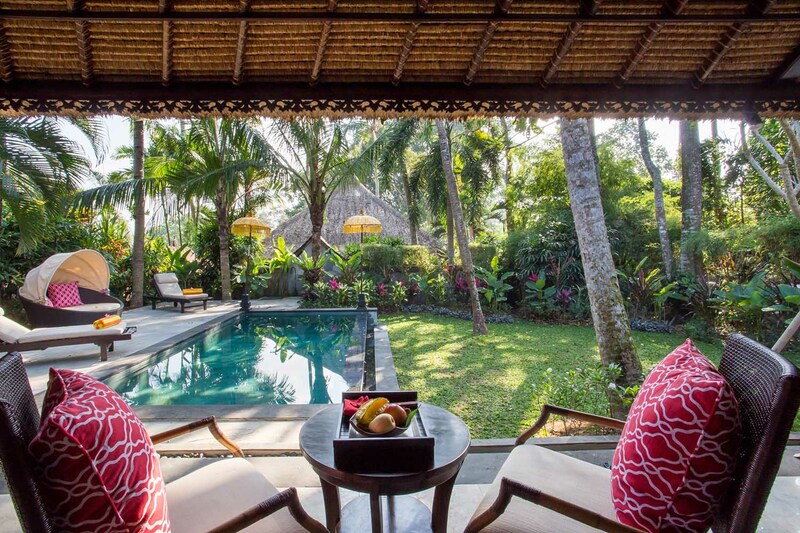 Enjoy breakfast on your own private balcony overlooking the main pool and be surrounded by beautiful, traditional Balinese décor and furnishings. 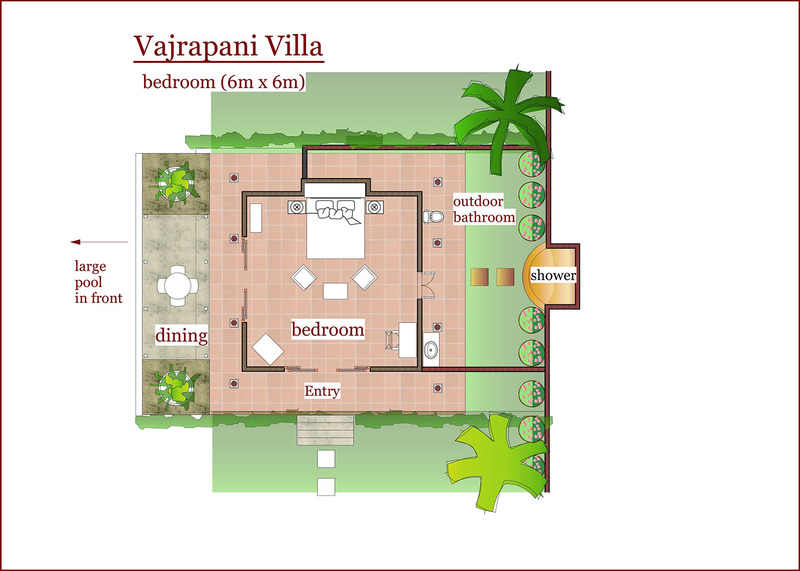 Situated next door to the large open lawn area and below the yoga Pavilion is this large villa with a King Size bed. 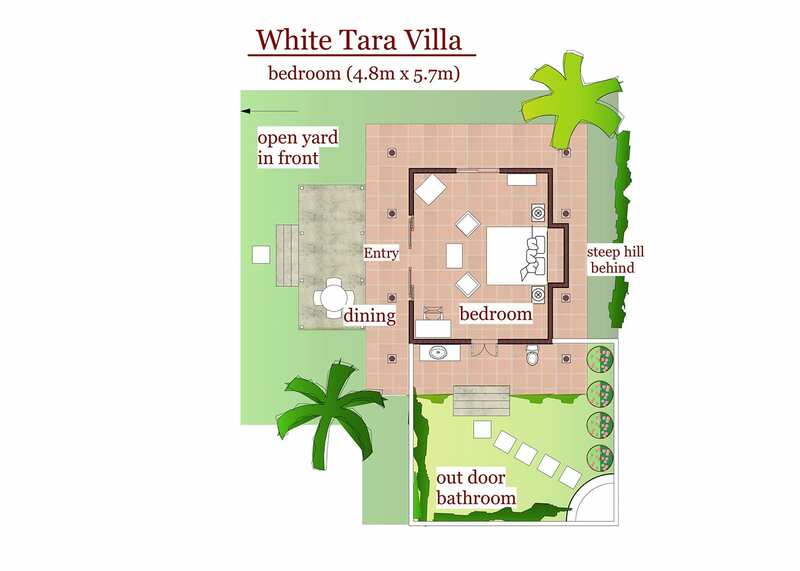 The outdoor sunken shower and bath is set in a large private walled garden. 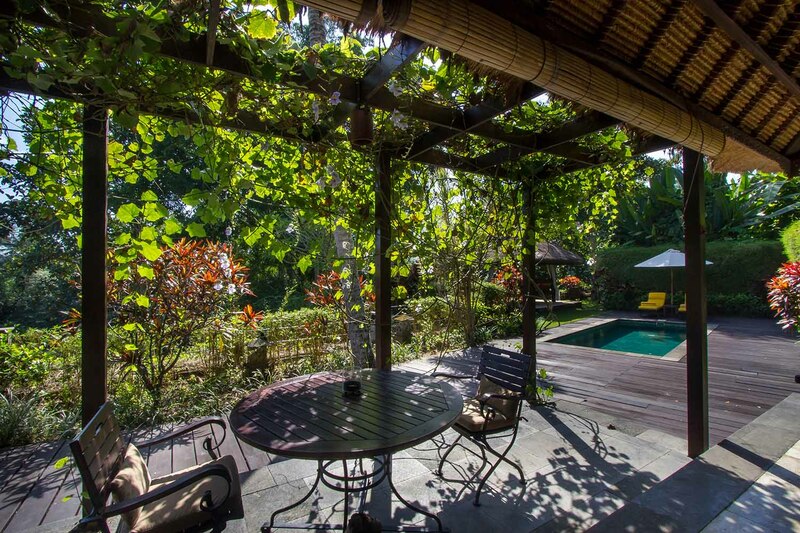 This villa has its own breakfast balcony and reading area overlooking open lawn, next door to the open air Ganesh Yoga Pavilion. 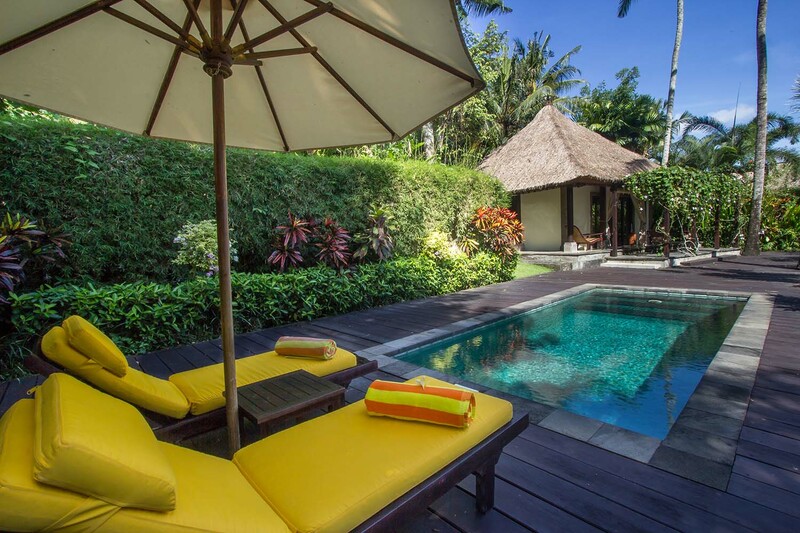 This villa is beautifully positioned next to the large estate swimming pool. 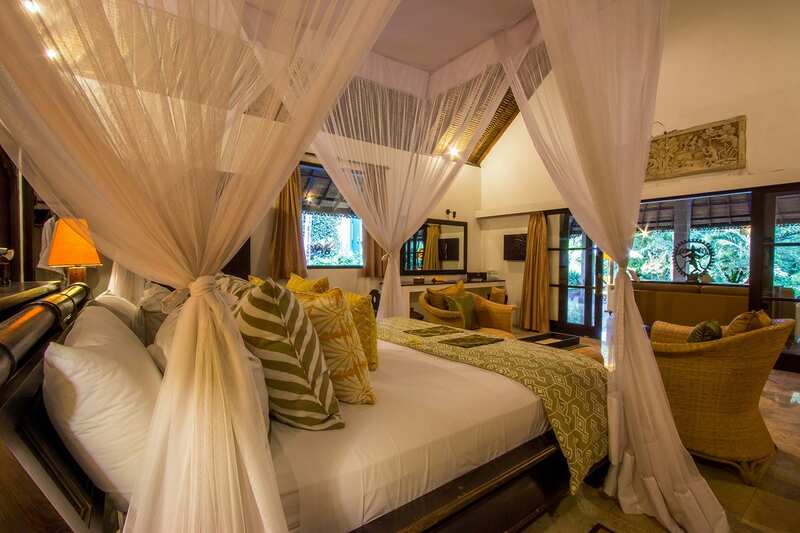 Open the double doors to your own balcony with views of the jungle across the Penet River. Being right next to the main pool this villa receives a lot of natural light streaming through the sheer curtains. 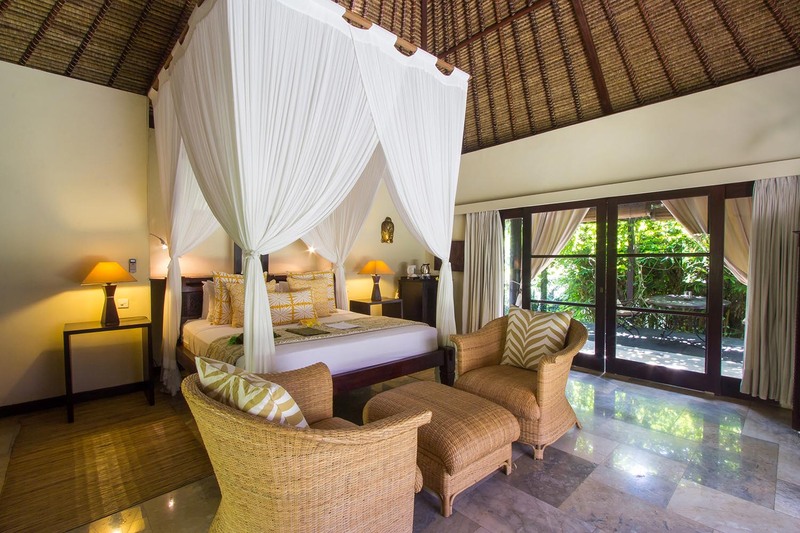 Enjoy the only Luxury One Bedroom Villa with a well-appointed and designed indoor marble bathroom for added luxury. As you enter the estate and walk down the stairs this villa is located high to your right overlooking the estates main swimming pool. 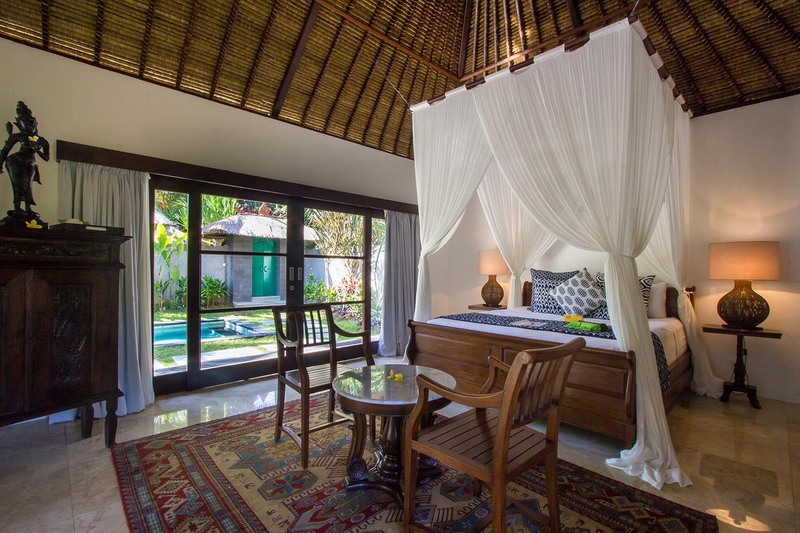 This is a private villa with a lot of natural light creating a sense of openness with marble floors and a traditional Balinese four poster bed. 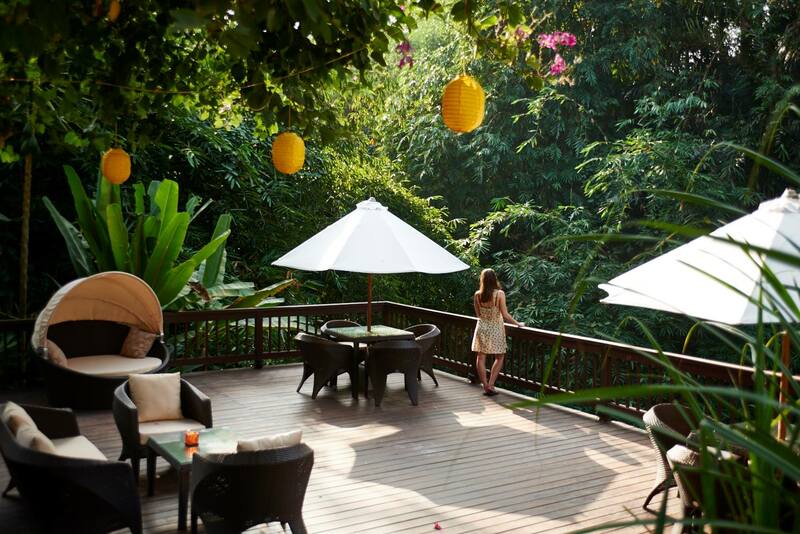 Enjoy breakfast on your balcony while gazing at the beautifully carved Buddha in the rock cliff face or overlooking the peacefulness of the estate. 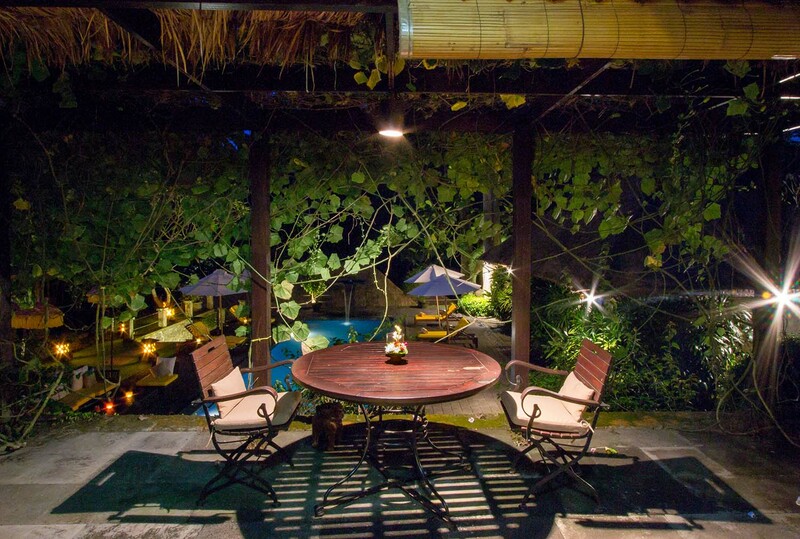 Villa Maitreya is set overlooking the Bebengan River and is the closet villa to the Ayurvedic Spa. 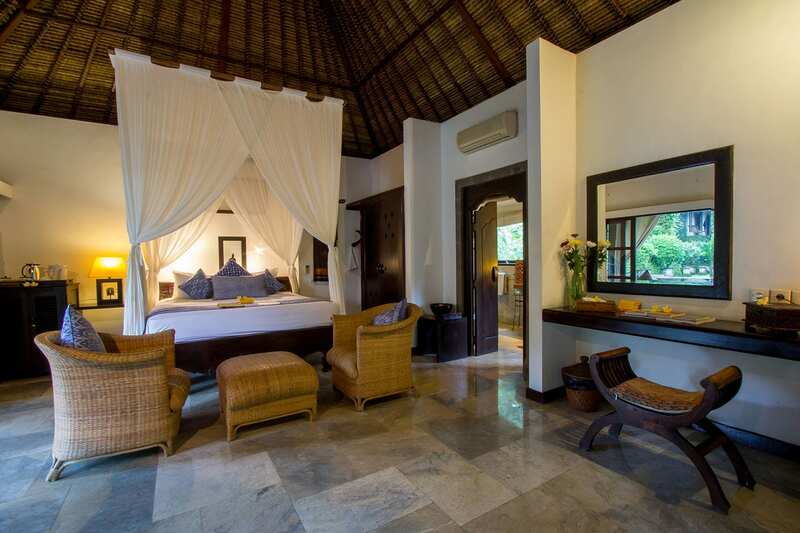 With its own swimming pool, open air lounge and impressively big bedroom, this is our largest villa on the estate. 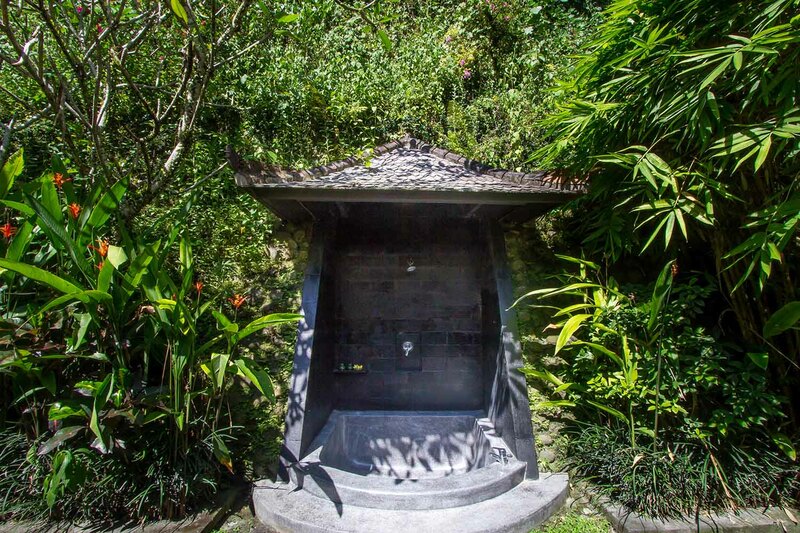 Nestled into a luscious garden is an incredible, private outdoor bathroom oozing traditional Balinese style. 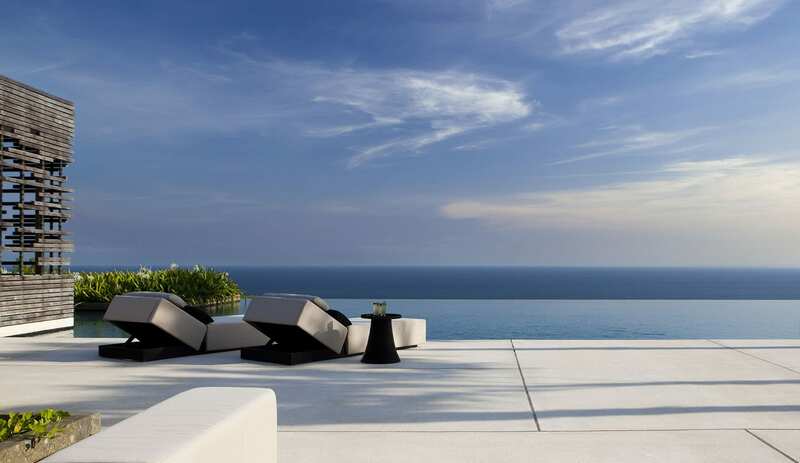 Nestled at the top of the cliff, facing the morning easterly sunrise, this villa is the ultimate in luxury coming complete with its own private garden with incredible views over the estate, private swimming pool, outdoor living area and luxurious indoor bathroom. Magnificent marble floors throughout the villa create a sense of five star living. 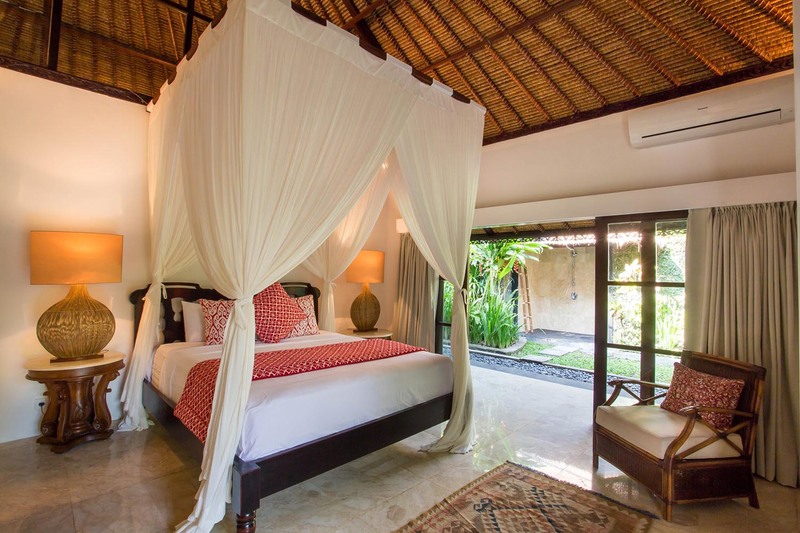 Sink into the beautiful four poster bed and look out to your private swimming pool and garden. 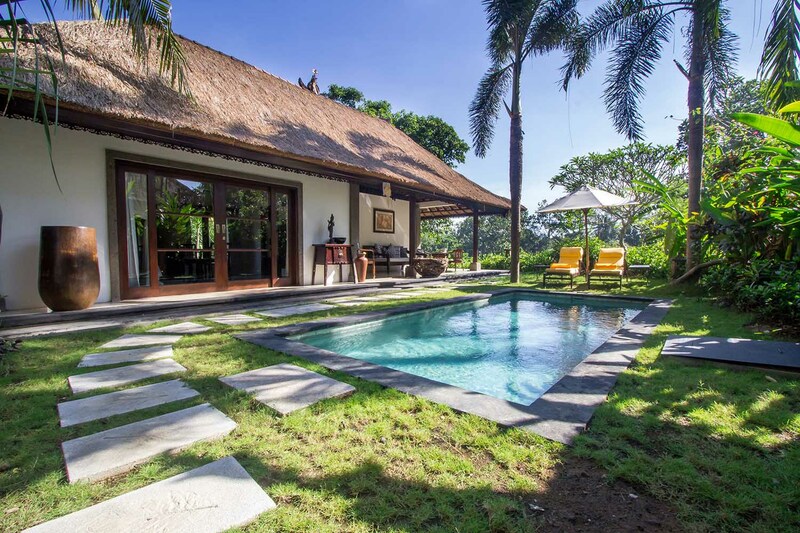 The latest addition to the Sukhavati Estate is villa Saraswati. 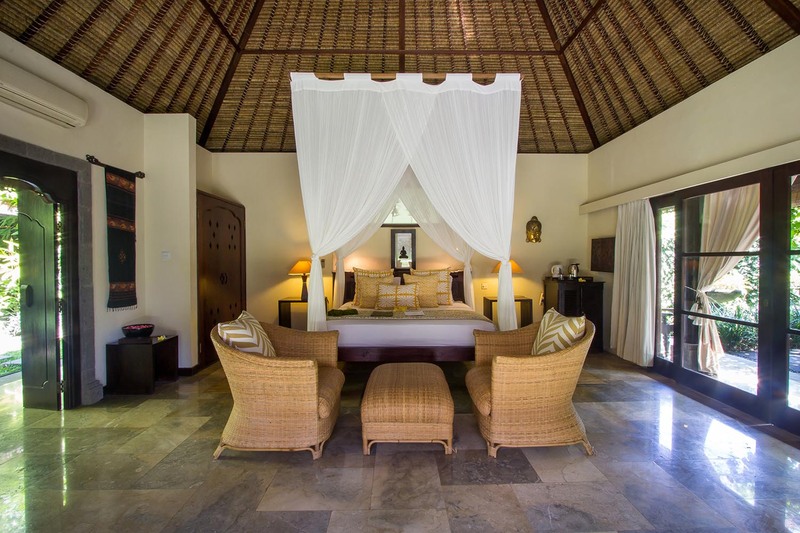 This villa boasts two bedrooms with beautiful modern furnishings complete with separate outdoor bathrooms, a shared open air lounge looking out onto a private infinity pool and perfectly manicured gardens. 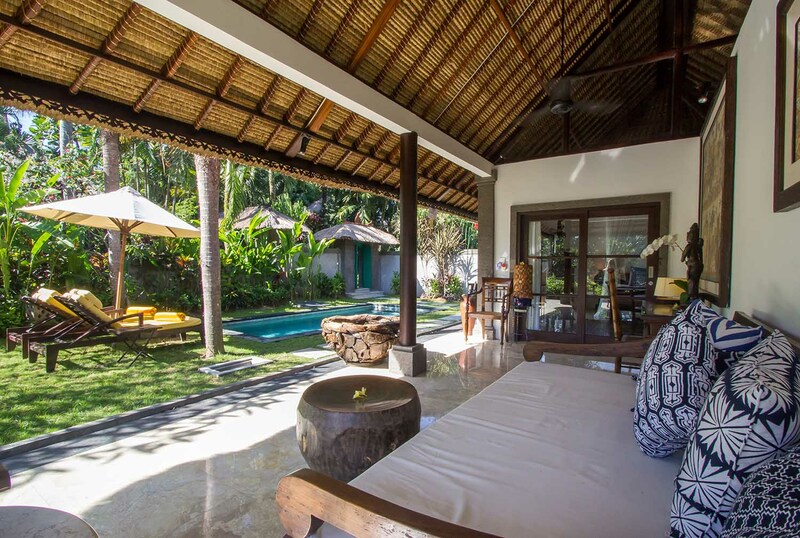 Saraswati is the only villa on the Sukhavati estate to have two bedrooms with separate bathrooms making this the perfect villa choice for friends wishing to share a villa. Located on the lowest tier of the estate, overlooking the gently winding Penet River, the River Spa Treatment Pavilions make for tranquil spots to indulge in authentic Ayurvedic spa therapies that will nourish the skin and soothe the body and mind. 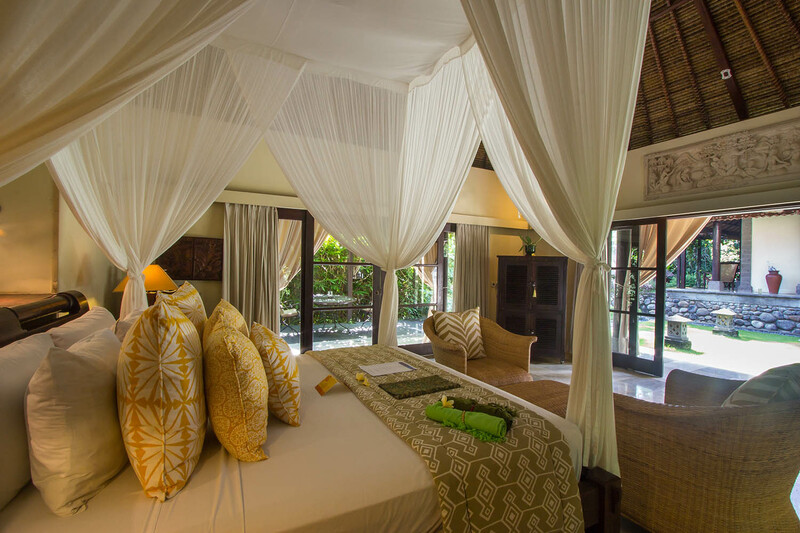 Everything about the spa encourages pure pampering, from the light filled reception area with soft cushions and jungle views to the spa pavilions with their marble open-air bathrooms and private wooden decks. 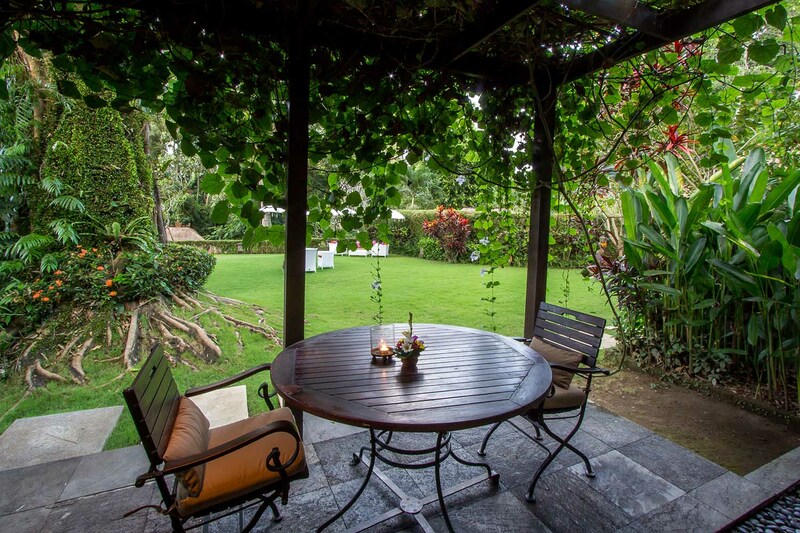 At Sukhavati Ayurvedic Retreat & Spa you can expect only the most nourishing and cleansing cuisine prepared by gourmet chefs using fresh ingredients sourced from local farmers and from the organic farm on the estate. The chefs work closely with the Ayurvedic specialists to plan dishes around your programme so that you get the most out of every meal. 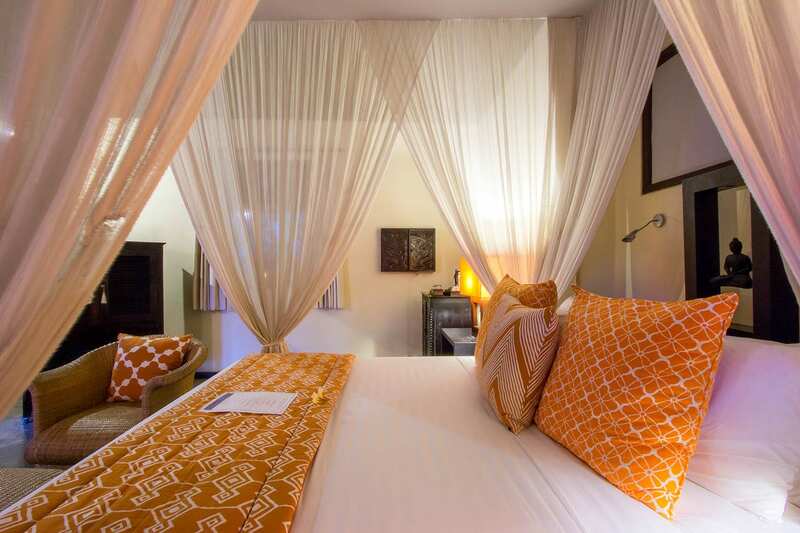 You can opt to dine on your private balcony with full butler service, on the River Deck overlooking the Penet River, or take part in the communal dining experience at the River Dining Pavilion. And should you want to continue your healthy eating plan at home, you can pick up a copy of the Sukhavati Cookbook with recipes straight off the estate menus. 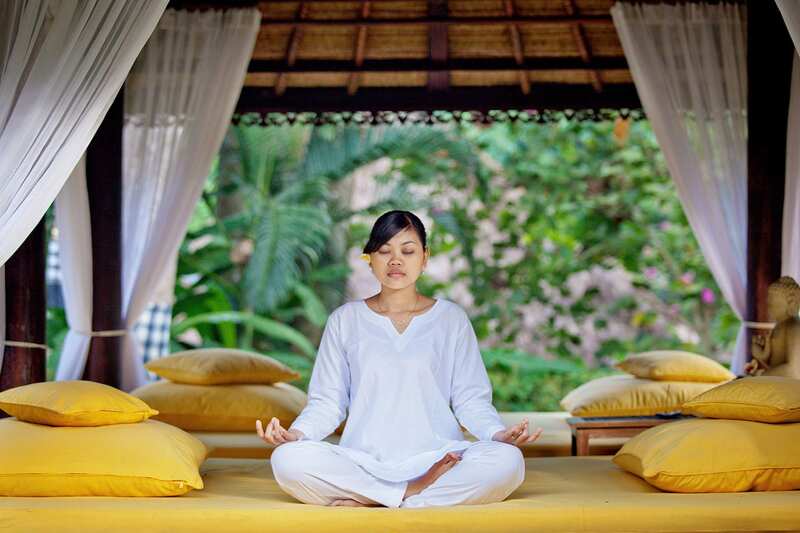 Although your retreat programme will already include yoga and meditation sessions, daily consultations, and lifestyle seminars, Sukhavati also offers extras like talks from visiting wellness specialists including naturopathic doctors, Vedic astrologists and meditation and yoga instructors, plus traditional Balinese dance performances on the estate every month. In addition, for those who want to get out and explore the island they can arrange everything from diving trips to mountain biking tours and whitewater rafting expeditions. 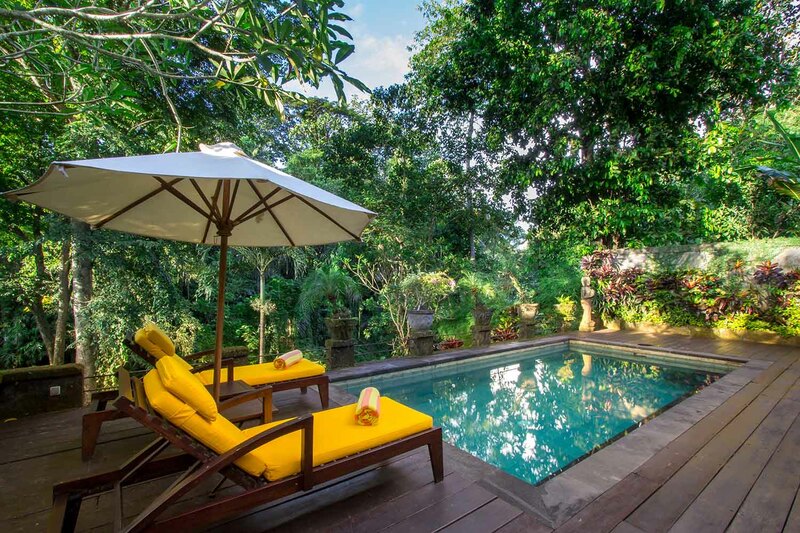 Sukhavati Ayurvedic Retreat & Spa is situated in the midst of pristine jungle along the Penet River in the rural village of Bebengan, just a 30 to 40 minute drive inland from the coast and Bali’s famous Tanah Lot temple. This secluded and peaceful location means there are no distractions, so you can truly concentrate on getting back to yourself and reaching new heights of happiness and well-being. Frankly, when I arrived at the Sukhavati, I wasn't really sure what to expect. I came there feeling burnt out from work and was hoping for deep relaxation. The first two days I had terrible headaches, a result of not drinking coffee anymore. I felt tired as my body started to release the toxins. But then, after 3 days something happened. I stopped drinking coffee and never felt more energetic than ever before... The tiredness was completely gone. I use to sleep 9-10 hours a night, but now it seemed my body needed much less sleep. I started to wake up naturally at 5 to 6 AM, feeling rested and energetic. It was quite a miracle as usually I couldn't do anything before I had a cup of coffee. My favorite thing were the massages. Every day I received synchronized massages by two gentle massage therapists. The spa staff was extremely skilled, caring and kind. All of the Ayurvedic treatments that I received were amazing, it was pure bliss. After 10 days I felt fantastic, nurtured and energetic! All the stress and tensions were gone. 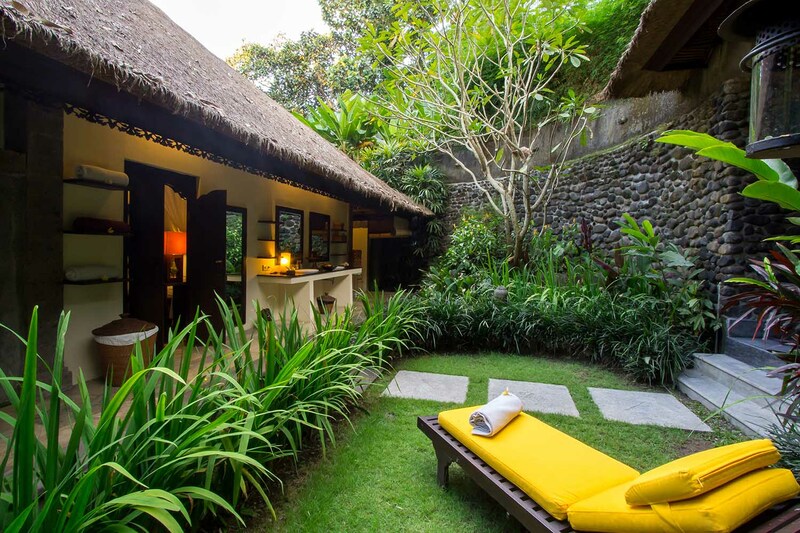 This was not just a spa vacation, my stay at the Sukhavati Bali was truly a holistic experience that put me in the most peaceful state of mind. Highly recommended to everyone who needs an escape from the daily routine, this place is like a little oasis! It's not the most budget-friendly experience, but how important is your health to you? For all what its cost, it's totally worth it. It will heal you and improve your health. My stay at the Sukhavati was a deep, life-changing and a transformational experience I surely won't forget... PS: I totally forgot to mention the rooms. 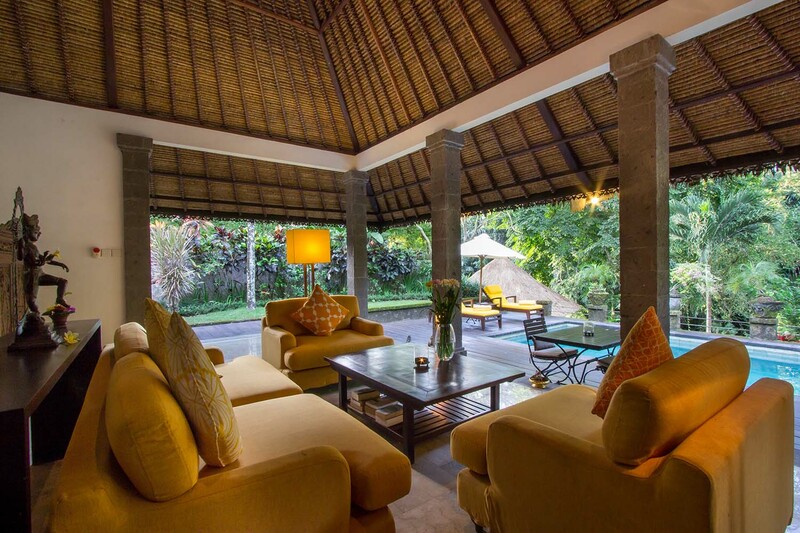 They have only a handful villas, each of them is unique and stunningly beautiful in its own way. 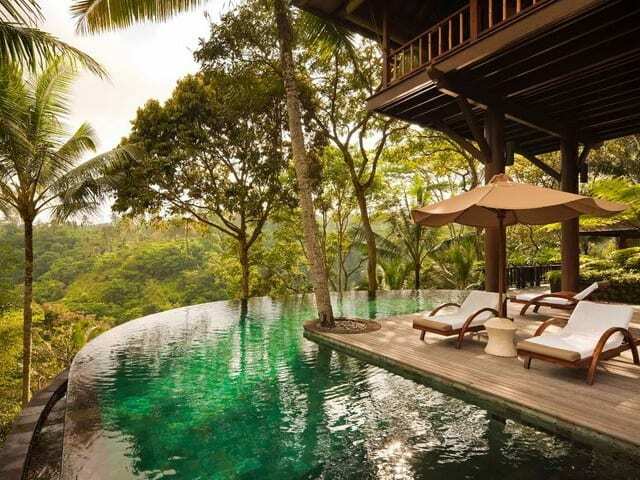 If you can afford it, take one with a private pool, you will love them. 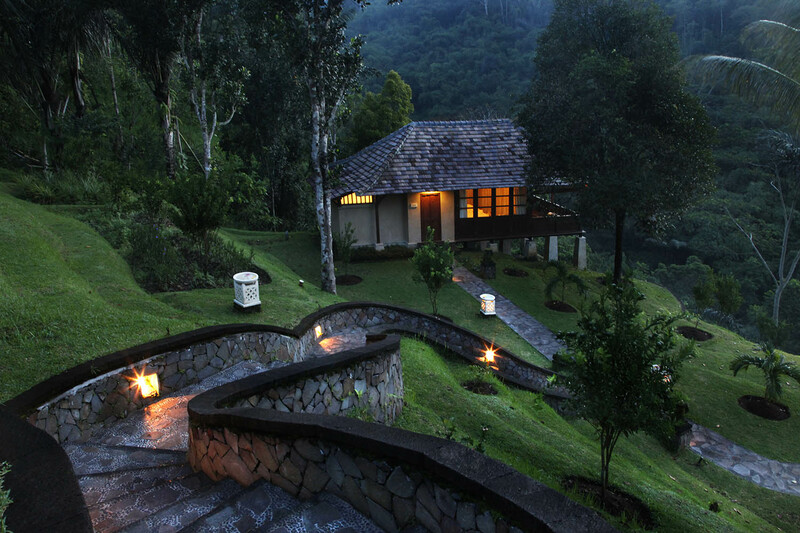 Sukhavati is nestled in the hills of Mengwi. Beautiful location and wonderful accommodation. 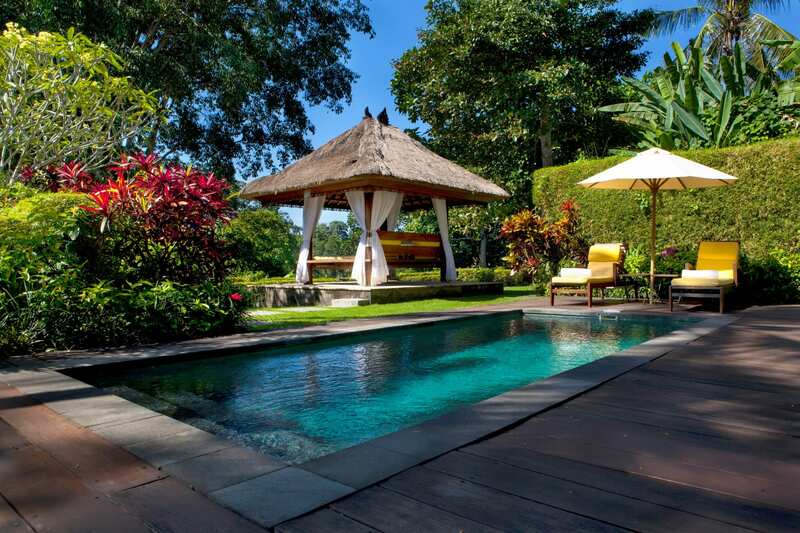 Can select your own pool and be totally in paradise - very luxurious. Personally tailored wholistic health program, food and spa treatments. Yoga, walking, meditation and some additional exercise with the steps make for additional health and wellbeing. Am refreshed and sparkling and ready for anything. I am eternally grateful for the opportunity to stay at Sukhavati. It offers a beautiful, nurturing, profoundly healing experience. 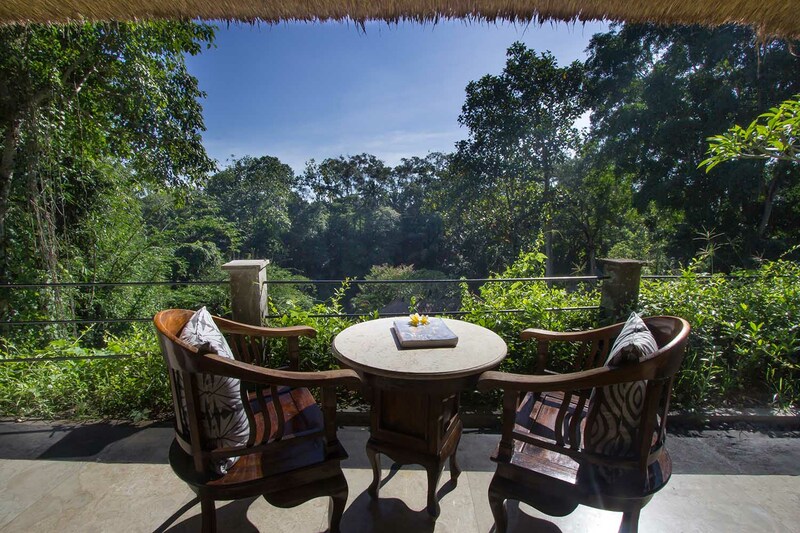 Nestled within an amazing life giving natural green jungle setting, you can almost feel the softness and oxygen in the air. The service was faultless, so warm and caring and professional. I couldn't recommend Sukhavati more highly. I just need to find a way to return every year! I hate recommending this place so highly as I may not be able to get a booking. 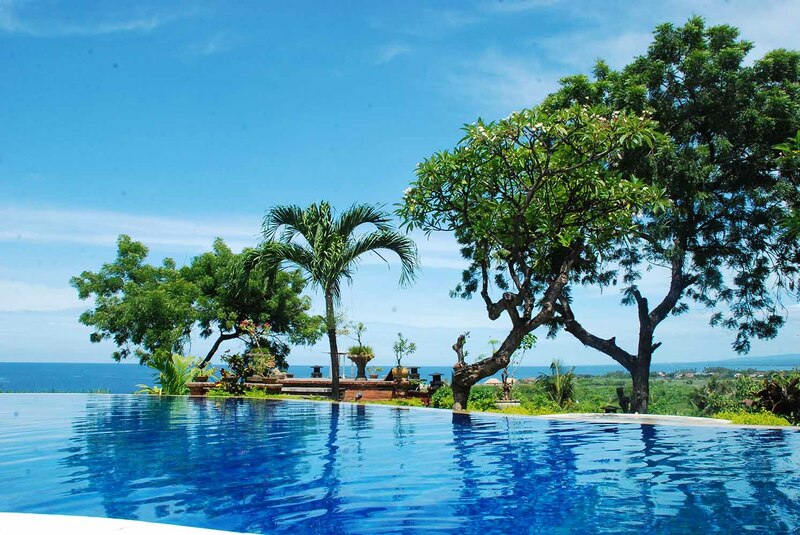 If you go you will definitely go back again and yes again.The staff excel, just can't do enough for you and the surrounds you feel like you are in the garden of Eden. Can't wait to go back in 6 months. 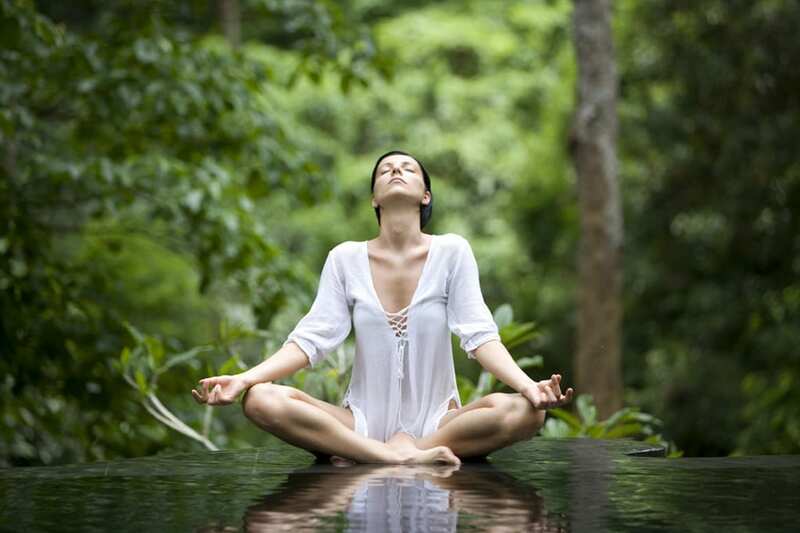 Sukhavati Ayurvedic Retreat and Spa is a place to heal your body and rejuvenate. A place to be for all Yoga Lovers and Spa Lovers. Especially the highly professional and lovely staff are the most beautiful and caring souls. We were really blown away by their warmth and attentiveness to our every need. We would definitely come again! After three 10 day visits I still can't decide on what I enjoy most; the serenity of the surrounds, the care and attention to detail from all the staff, especially the ayurveda technicians, or the nourishing food and drinks. All this, in addition to yoga and meditation makes Sukhavati and the complete PK experience so special. World Class Facility - World Class Service! 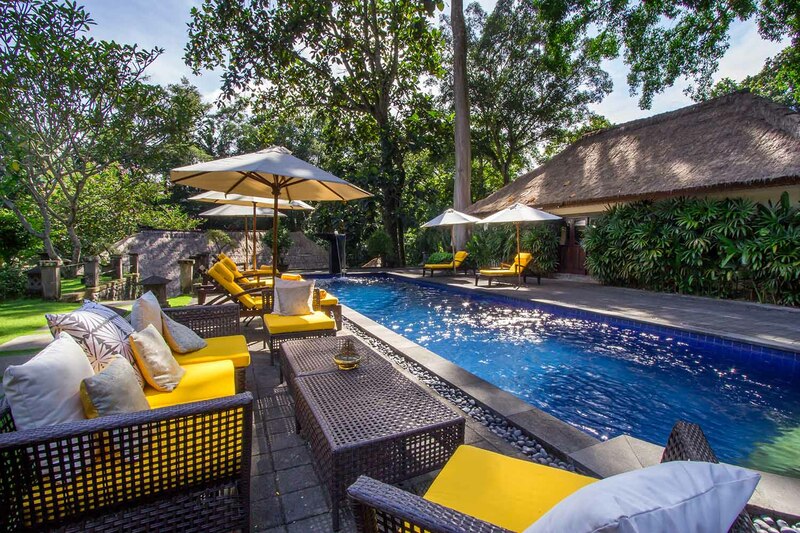 This was my second trip and my partners first trip to beautiful Sukhavati, one of Bali's best kept secrets for health rejuvenation. 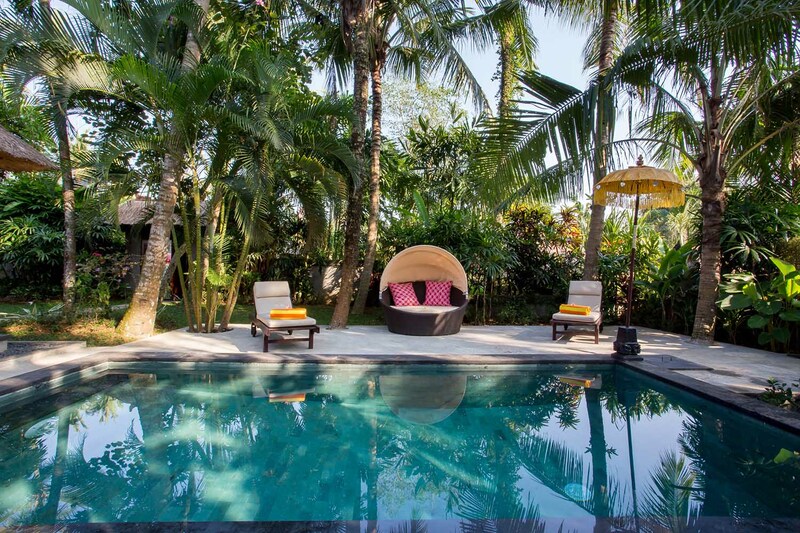 There's nothing like enjoying fresh juices, superb dosha balanced food, synchronised massage, yoga, facials, casual village walks through rice fields, oil treatments and meditation in some of the best surroundings on the planet! Oh and the service from the beautiful respectful and always friendly staff is second to none. 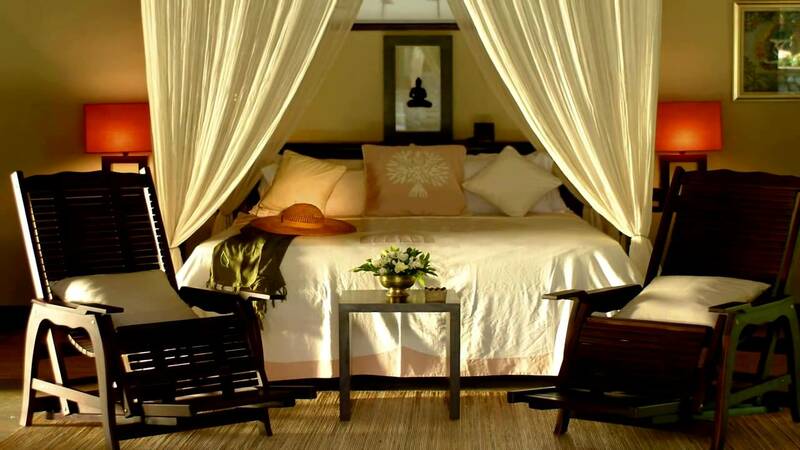 If you only ever do one health retreat in your life, make it this one! I first went to Sukhavati a year ago, after I had been through a big upheaval in my life that had lasted many months and I was left feeling generally burnt out and exhausted every day. Sukhavati was such a nurturing experience that left me feeling rested and ready to go back to my every day life firing on all pistons again. I have since been back to Sukhavati another two times in the past year for a 4 day long weekend, when I have felt the hum drum of life getting on top of me again. The spa treatments are out of this world, the food is wonderful, the yoga instructors are very good, the villas and the grounds are so tranquil and relaxing and each time I visit I have the pleasure of meeting some new and fascinating people. I truly believe that Sukhavati has removed and continues to remove deep rooted stresses from my body that has left me in a better overall state of equilibrium and health. My Wife and I spent 7 wonderful days here over New Year. I didn't know exactly what was involved but I knew I would embrace whatever was going to happen. I met with Geoff, one of the owners who described it as a 'total mind and body reset' which was a perfect description. I always thought I eat fairly healthy but Dr Raju took my understanding to a whole different level. I can not express in this short review how great this place is. Go and embrace it all, you will improve your health and mind, improve your knowledge and the person you arrive as, will not be the same person that leaves. From the moment I arrived at Sukhavati I knew something special was awaiting me. My 6 days at this beautiful retreat made me feel like part of the family and I've hopefully made some long lasting friendships. With the intent of distressing and taking some time to reflect on life, Sukhavati provided me with the perfect oasis. 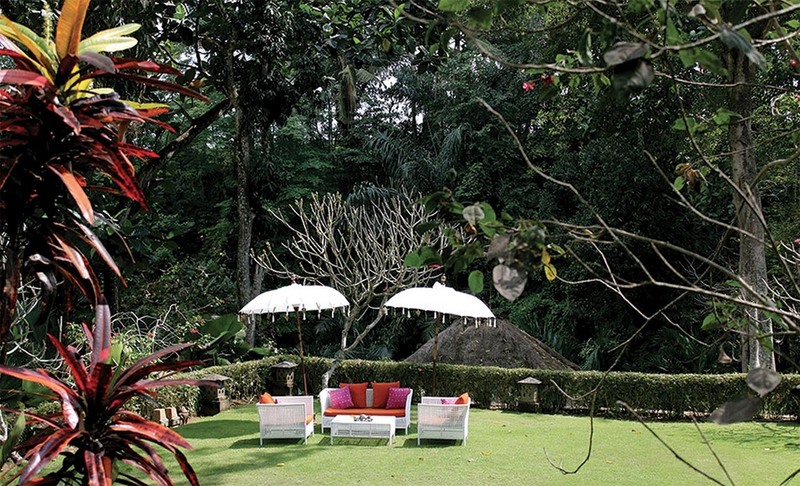 From my beautiful villa to the stunning gardens surrounds I was captivated and instantly relaxed. The extensive knowledge and education provided by Dr Ragut and the team guided me through the process of getting back to a healthier and better approach to life both physically and mentally. I can't speak highly enough about the vegetarian food, the tailored treatments which were the best I've experienced after visiting many retreats globally. I thoroughly enjoyed my yoga lessons with the family, walking through the local village and getting to know everyone who was staying at Sukhavati. I left with a heavy heart and wished I could have stayed longer. Now I'm armed with a new approach to work and leading a more balanced day to day life. A few days later feeling super relaxed and with a very clear mind. I can't wait to return. Can there be a better place in this world to get to know yourself? I suppose that waxing lyrical on any successful holiday destination is to be expected, especially after having just returned. But Sukhavati is more than a holiday destination. We all go there for our own personal reasons: Be it a medical problem that needs correcting or regulating or be it an emotional or spiritual one. Be it to perfect the art of yoga or be it to advance in transcendental meditation Sukhavati seems to have the right answer. From the owner Steve, to the doctors, to the staff, to the other guests - right down to the little touches via the treatments, the yoga, the attitude, the peace and the love that is so all consuming at Sukhavati. It is luxurious. It is indulgent. You are special. You matter. You are worth it. You are made to feel as if you belong. You are sent home with a sense of purpose and a determination to live your life in a different way. And it is not hard to follow once back to the daily grind. It is, in my mind and surely in the minds of countless others, unsurpassable. From the moment I booked this retreat through to returning home; this was a five star experience. I booked to attend an Intuitive Wellness retreat there, however I did travel solo. This retreat isn't near any markets or shops, it's away from the madness. I was greeted at the airport by one of the Sukhavati staff members who drove myself and another guest to the retreat. As the car rolled through the front gates of the property, any stress I was carrying just melted away. Waiting for the car to arrival were the amazing staff, handed a welcome drink, adorned a flower necklace, and a wooden necklace and was whisked off to the foyer to drink my welcome drink. 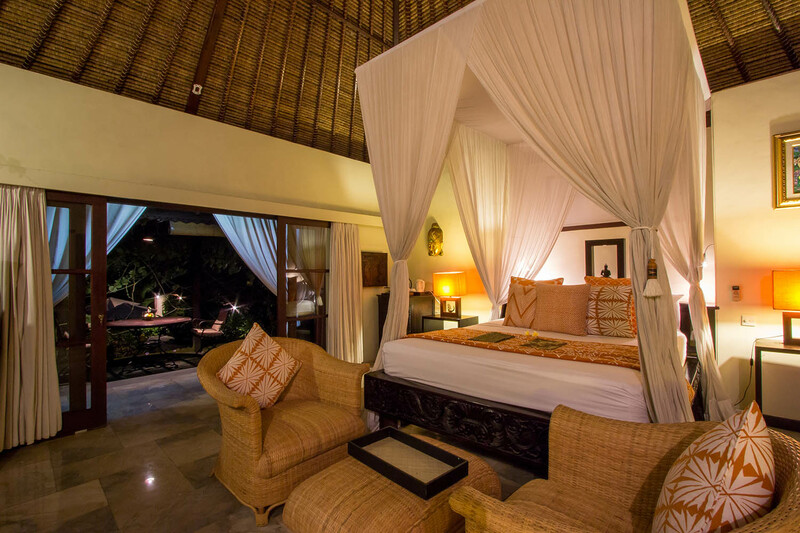 After I was shown around and guided to my stunning private pool villa, my bag already placed in my room. Days followed with sensational food (I hadn't had Ayurvedic food previously and its really good), incredible and multiple spa treatments, fun yoga sessions and truly deep rest and rejuvenation. I cannot rate this experience higher, it was simply one of the best holidays I've ever had and I'll definitely be going back! Me and my wife loved every moment of this paradise! The staff and service is awesome, felt like we knew each other like friends by the time we where leaving. The place is gorgeous, rooms are really great and the ayurvedic concept - treatments and food is fantastic! All the yoga teachers are very attentive and passionate about teaching. Only problem we couldn't stay for more than 5 days. Will definitely come back for more! 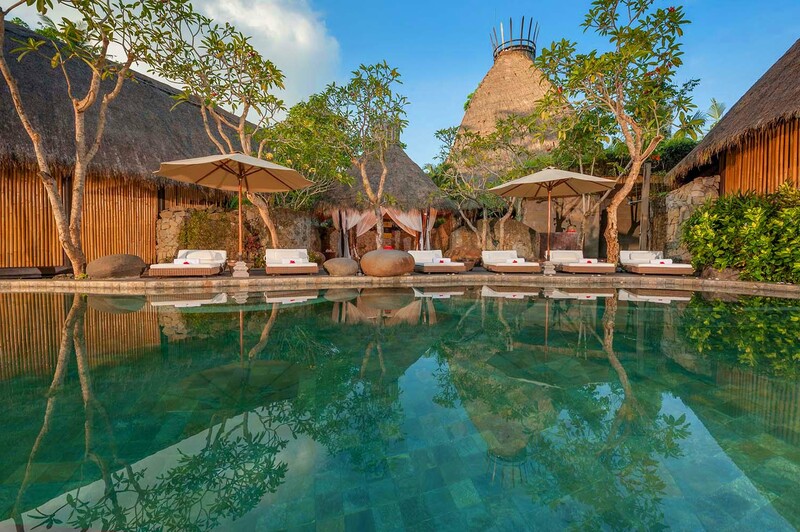 This is an amazing and special place in Bali, one I would highly recommend. Prior to arriving at the property I was met at the airport gate by a staff member and then driven to the property. Upon arrival I was greeted by the friendly staff. The setting was out of this world amazing. Given a brief tour prior to dinner with the other guests. Away from the hustle of the main 'tourist' area's of bali, however you can request a driver take you into town for a few hours. The wellness program was more than expected and definitely needed due to the busy lifestyle I have. Staying ten days allowed me to take a moment out and feel recovered, both mentally and physically. The daily massages were a treat! I would highly recommend this place for those needed a break and wanting time out. 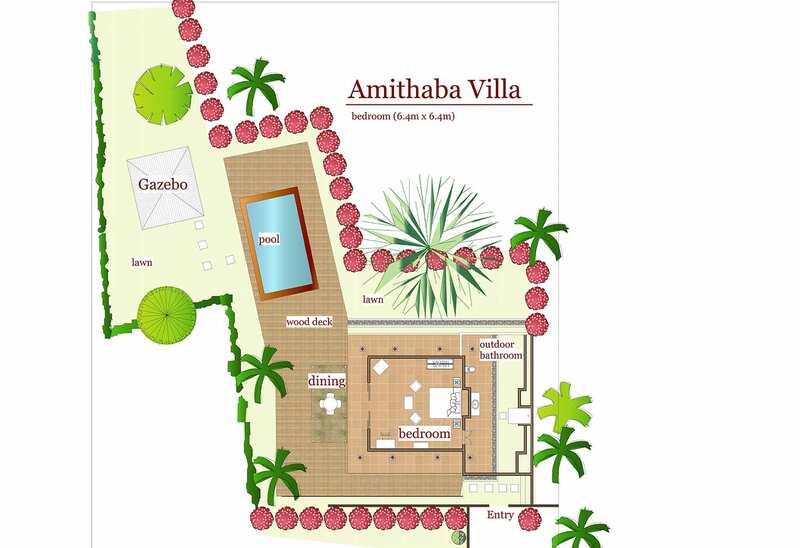 Request a poolside villa - you'll have your own private pool! I decided to return to Sukharvati for a second time earlier this year after feeling drained and worn out from a very busy year. I opted for 10 days, last time was 7. To see the beautiful staff and experience their nurturing again, along with returning to meditation and yoga practise sent me home with a renewed sense of balance and health. Recently completed a 3 week Ayurveda program, and it was excellent. 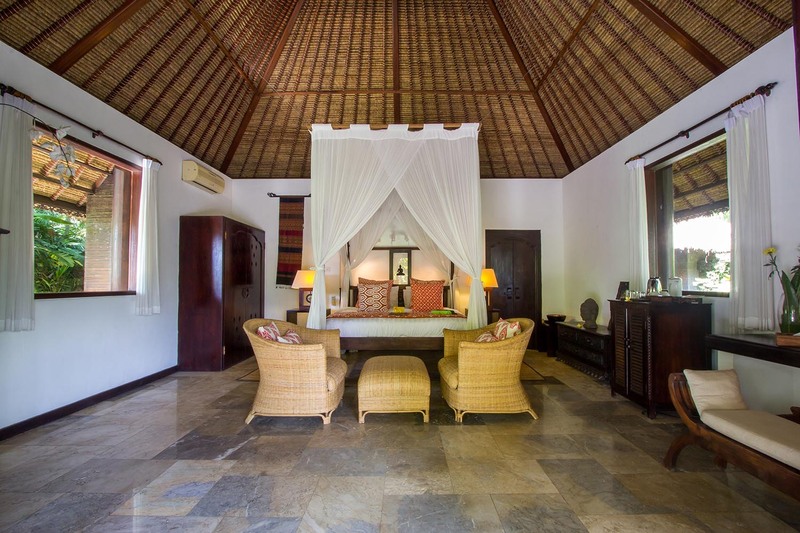 The amazing service from the staff, the food was so well prepared, first class villa accommodations, twice daily hatha yoga, the daily ayurveda massages were so theraputic, truly bliss facials and daily followups from the resident doctor. Can't give enough compliments for the program or to the staff. It seemed most guests stayed about 10 days. 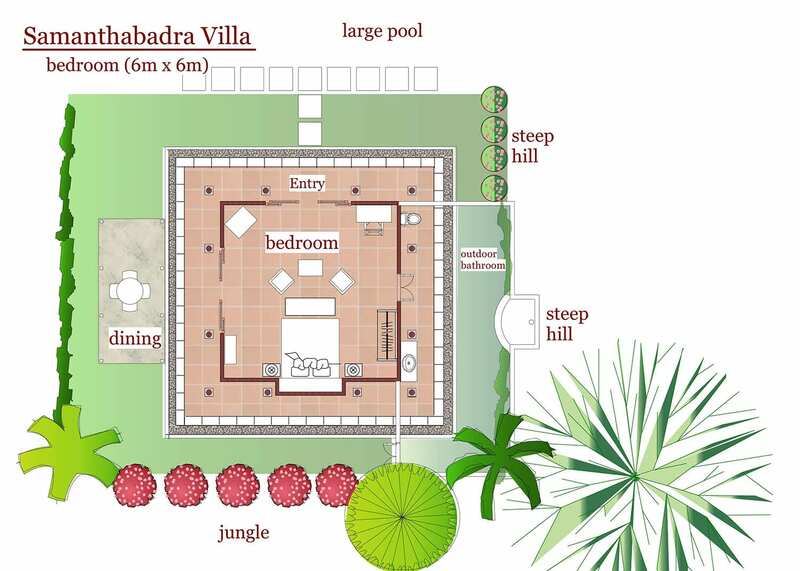 If you can plan for 3 weeks, that is ideal to receive the full benefit of the Panchakarma program. I am sure glad I did. My teenage daughter and I spent 10 blissful days at Sukahavti which I believe will have an impact on her life (and mine) forever - she experienced many 'life' lessons simply by being there; concepts about healthy eating, exercise, benefits of relaxation/quiet time, natures' cycles, diversity of people (staff, local villagers, other guests), the importance of community, family and being happy; lessons that don't have the same impact coming from a parent. 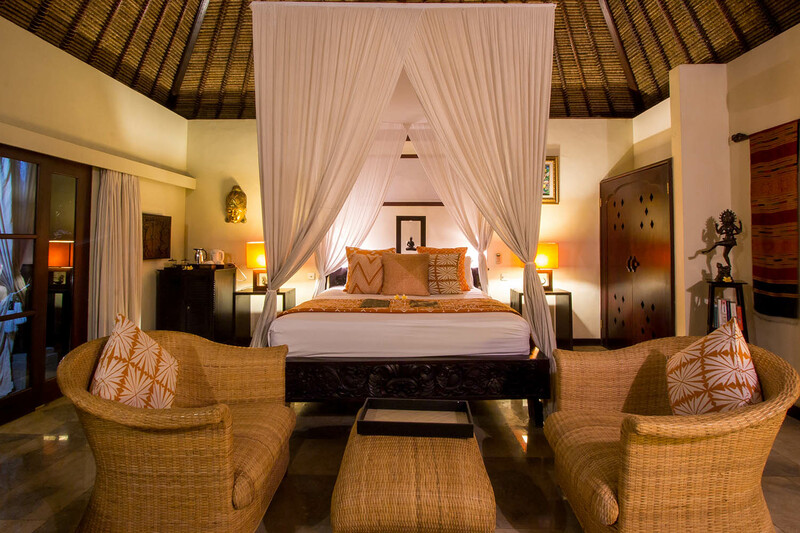 The multi-layered effect of exotic location, beautiful accommodation, engaged, caring and skilful staff provided the perfect foundation for complete rejuvenation, healing and relaxation. The treatments were unique and targeted specific medical needs as well as providing a 'blissful' after effect. Yoga, mediation, ayurvedic talks and cooking classes all added to a well rounded program which refocused our thoughts and reminded us of the value and simplicity of keeping healthy My daughter will miss her Balinese friends who cared for her, fed her and taught her so many wonderful new things. Sukhavati is sensational. My sister and I had 10 days there recently in a divine villa with our own pool and a large garden area all enclosed for total privacy. Breakfast of your choice from an extensive menu is either bought to you, or you can enjoy it with other guests in a lovely dining room by the river. We choose to have it around our own pool most mornings, sometimes we also had lunch in the villa, mostly dinners were shared with other guests at the large communal table. After massages and treatments each day, early morning walks, daily Ayurvedic doctor consultations, yoga, meditation (all options and all included in the price - nothing compulsory at all), facials etc it was lovely to join the table at night with some very interesting guests... there was never a dull moment at the dinner table! The staff are outstanding - so well trained with genuine smiles.The owners of this resort can be very proud of what they have accomplished - TOP MARKS. I came back to Australia 4 kgs lighter, refreshed and felling ready to tackle the world again. I will return. 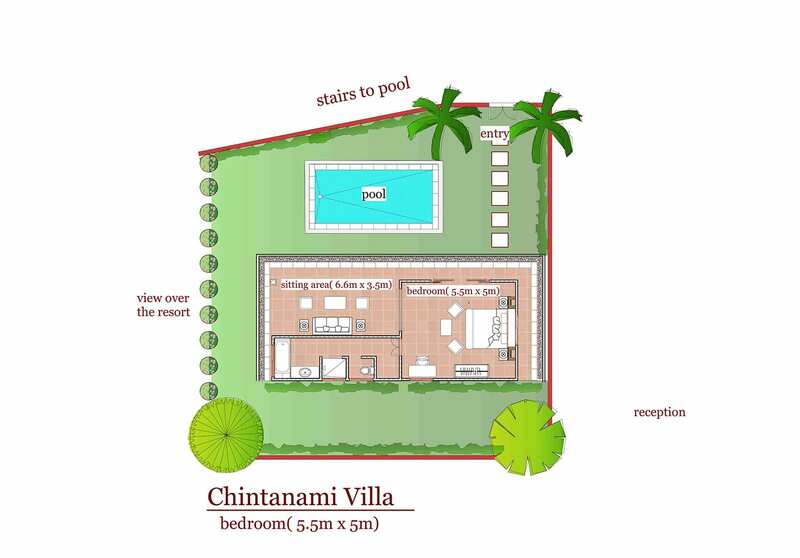 Go for a pool villa... a little extra but well worth it for the privacy. I must admit at first I wasn't entirely sure what to expect. 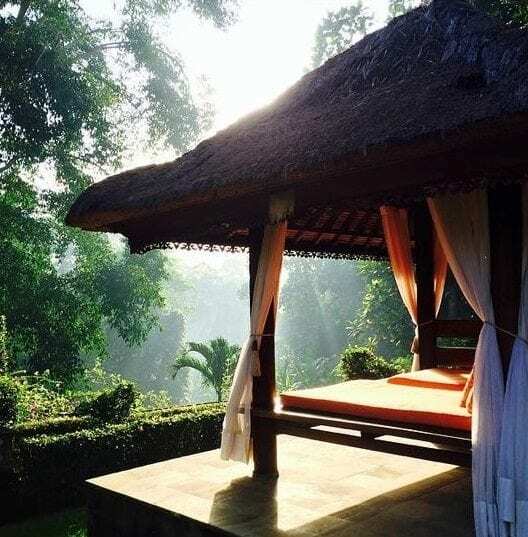 This was my first experience of both Bali and the Ayurvedic approach to health and it was wonderful in every way. First and foremost the staff at the resort were amazing, from the minute I was guided through immigration at the airport and met by the driver, to the day I left, they were focused on me and my needs without being intrusive. They were sensitive, and caring and I felt nurtured and looked after every step of the way. The facilities were great, clean, comfortable and again with a focus on details that really enhanced the experience. This is not like many spa resorts, here the treatments are tailored to you specifically. They help you rejuvenate and heal in the best possible way for you. Healthy food, gentle yoga, focused meditation, all interwoven to eliminate stress at a deep level. I had 11 days and will certainly return. Also recognise that your trip and commitment is to your health so don't try and do too much in terms of sight seeing - but if you do want to venture out a little, the resort drivers are great and are very happy to share their local knowledge. The Sukhavati program is the best of its kind in South East Asia. For Westerners, it finds just the right balance between the disciplines of Ayurveda and the comforts you would expect at a high-end Spa resort. 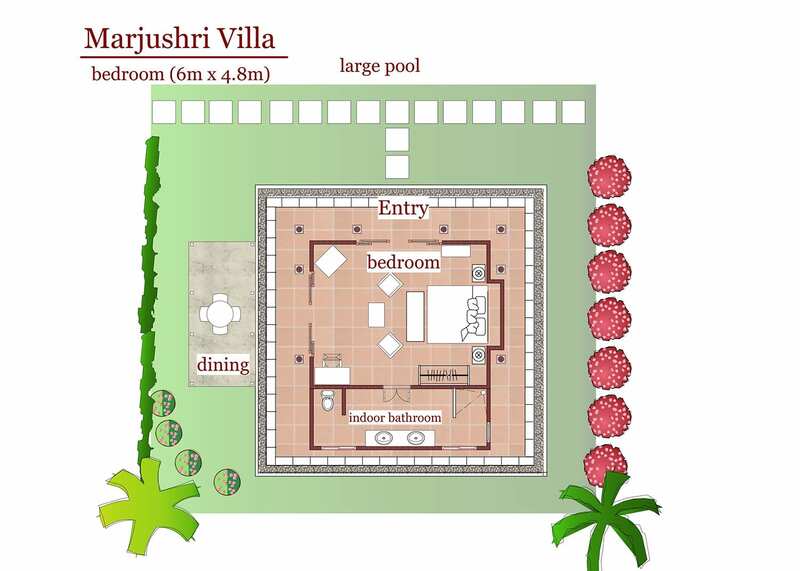 The setting is filled with the spirit of life and when complemented by outstanding, nourishing food, Ayurvedic wisdom and caring, professional people anyone looking to live, love and be happy could not fail to be refreshed by Sukhavati. The combination of a beautiful environment, daily massages, meditation and yoga, matched with the care, attention and loving approach demonstrated by everyone at Sukhavati supported our rejuvenation to great health. Thank-you team! My husband & I were gob smacked when we arrived at Sukhavati, the beauty and tranquility of this retreat had us instantly mesmorised. A complete Ayurvedic experience from daily full body massages/facials, panchakarma health assessments, individual treatments and dietry program (the food is delicious!) along with morning and evening yoga and meditation guided sessions. Staff were divine and accommodation like a honeymoon. We were cleansed and rejuvenated in the body, mind and consciousness and came away feeling A-mazing! Finally, a detox program that truly delivers. We will go back, that is for sure. 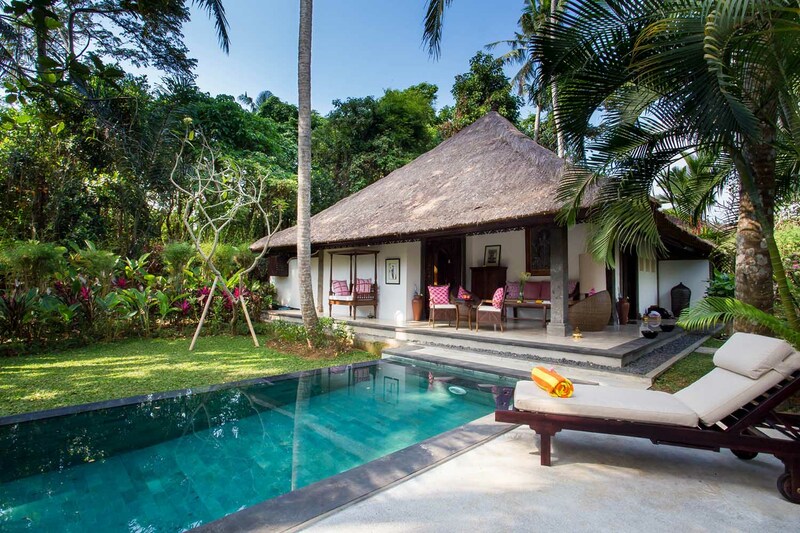 Set on 5 sprawling hectares of verdant gardens and hills in the mountains just outside of Ubud, Bagus Jati Health & Wellbeing Retreat is a world-class centre of holistic healing using a combination of ancient Indian and Chinese inspired treatments.